Hannah Warner is a junior at the University of Minnesota, pursuing a degree in aerospace and mechanical engineering. She currently maintains a full class schedule, is an active member of the Minnesota Society of Women Engineers, enjoys cooking, reading, working out, and in the last two years has successfully secured three consecutive internships through the SciTechsperience Internship Program. Even though SciTechsperience offers many internship opportunities each program year, securing even one can be a competitive process. So, what better way to offer insight into using SciTech like a pro, than to ask a seasoned expert? 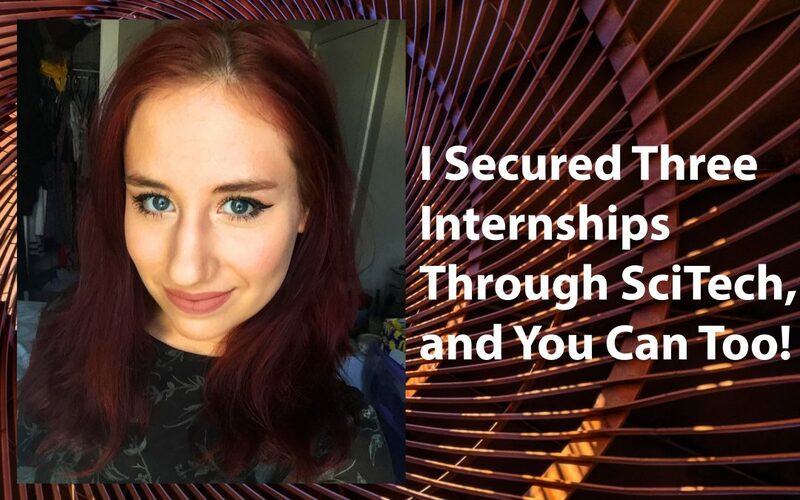 Warner graciously agreed to share her approach to applying and interviewing for internships in hopes that her experiences will help fellow SciTech students refine their technique as well. I made a 1-2 sentence objective for my profile, then relied on my resume for the rest. I am selective about what positions I apply for, since I spend a lot of time making sure I write a strong cover letter, and I want to ensure my skills and background would be a good fit for the position. And I end the email with 2-3 sentences about why I am interested in the position and what would make me successful as an intern. Times I have failed, and times I have succeeded. For times I have failed, I make sure I address what caused me to ‘fail’ in the situation and what I would do differently. I believe my leadership experience within the Society of Women Engineers (SWE) has been invaluable in helping me prepare for interviews. Example: After leading monthly conference calls as a collegiate representative for 54 SWE collegiate sections, and presenting personalized modules to section leadership teams as a Leadership Coach, I know really well how to think on my feet and effectively convey my ideas. And working as a research assistant at the University of Minnesota for a year working on an Undergraduate Research Opportunities Program (UROP) project in materials engineering for a biomedical application. With all this good advice in mind, it’s also important to remember that no two candidates are alike and neither are their backgrounds or skillsets. The takeaway from Warner’s examples is how to highlight your own successes when reaching out to potential employers. Tailoring your approach and having the right preparation will take you the rest of the way. Additional assistance and interview coaching is also available at most college career centers. If you’re ready to take your resume to the next level, they’re there to help. For more advice from SciTech Alumni, check out the other Student Resources available on our blog.